AST SCOPA have retained the Senior A Shield with a 25-22 win over Vailele in the fifth round of the Taula Apia Rugby Union yesterday at Tuanaimato. Vailele lead 12-10 at halftime, and coach Aukuso Fruean said it was a very tough game. 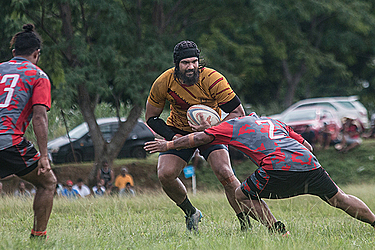 He said the performance was encouraging for the rest of the season with the club’s attention now shifting to sevens with the Vailima Marist International Sevens Tournament next weekend. Fruean said all the sevens players were playing in the 15s to keep them fit and ready for Marist. SCOPA now switch into sevens mode also, and are glad to hold the Shield heading into the break next week. Player/coach Taito Louis Lene said they didn’t want to lose it after just one week. He said it would be good to keep morale high in the club before Marist. Taito said it was a close game in part because they were missing so many players through injury. He said a lot of the team had to step up and fill those gaps, including those who normally only coached like himself. He said Vailele ran the ball a lot, which is exactly what they expected. Taito was glad that SCOPA were able to finish strong, and hopes the momentum will carry over to the sevens.